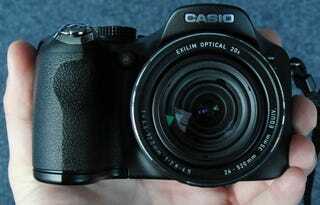 Maybe you didn't even realize that the hallowed Exilim EX-F1 super-slow-mo cam got a little brother, the new $600 EX-FH20. We finally got to check it out today and it's definitely a winner. Slightly slimmer than it's pricier counterpart, it also has a cleaner UI making it easier for a novice to use. 1000fps slo-mo video looked great, and the 40fps burst mode worked well, prerecording images in order to capture the perfect moment, even if you have a slow trigger finger. It even has a slight bump in the megapixel department, 9.1MP to the EX-F1's 6.0MP. The EX-FH20 is just hitting stores, so check the gallery to see how it measures up to the EX-F1. And of course stay tuned for our full review.